21st century anesthetic protocols maintain your pets blood pressure and minimize stress on the heart, liver and kidneys. Technology to monitor and maintain normal respiration, blood pressure, EKG and body temperature throughout surgery. Thorough pain control keeps your pet as comfortable as possible. See the services page for details on our comprehensive, multi-modal comfort control measures. A successful outcome depends on an accurate diagnosis, your understanding of the situation, a sound surgical plan and attention to the details of anesthesia, surgery and recovery. 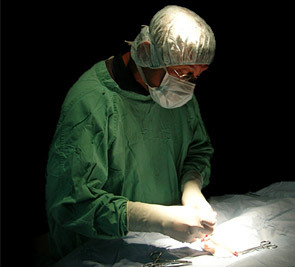 Our surgeons and staff offer over 50 combined years of experience to benefit your pet. Dr Mummert treats torn cranial cruciate ligaments (ACL or CCL) by performing a tibial tuberosity advancement surgery (TTA). Click here for details.